For those who have yet to discover an entry point into on-track performance driving, the process of getting there can be a bit intimidating and confusing at times – it’s one of the main reasons we decided to create this series in the first place. Earlier this year, the SCCA announced a new program called SCCA Track Night in America Driven by Tire Rack, designed not only to address some of the vagueness surrounding the means of getting on track and hooked up with the SCCA but also to make that process as simple and low-cost as reasonably possible. For those who’re looking for a pathway into track driving – or have friends and/or family looking for a way to test the waters, this program is designed to accommodate that demand. 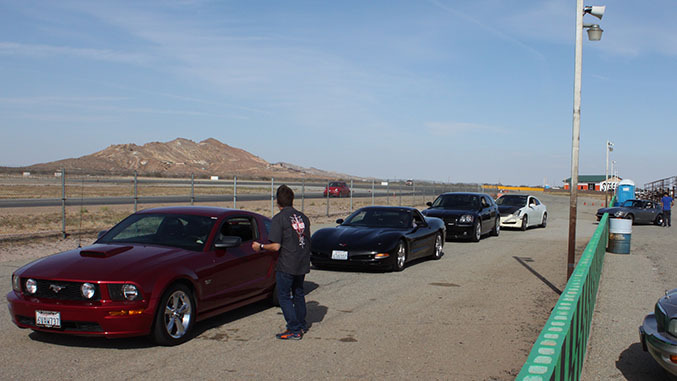 We decided to head out to a local Track Night in America event held at Willow Springs Raceway with a track newcomer to check out what’s entailed and to give a driver with no prior track experience a chance to try it on for size. What Is Track Night In America? Track Night in America is, at its core, a program that the SCCA has created to give anyone with an interest in performance driving a very simple and inexpensive way to drive their car – be it a highly modified track day car or completely stock commuter – on a race course. 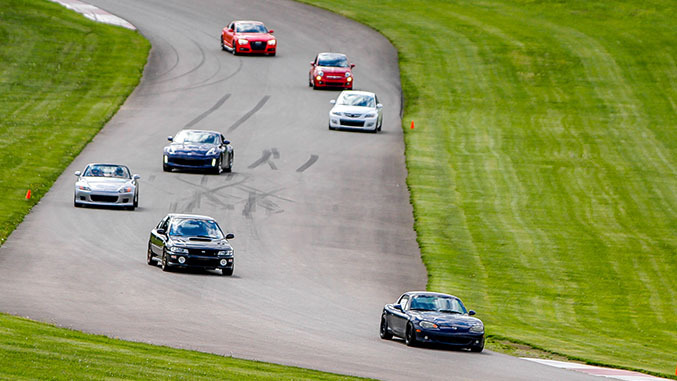 Billed as “The Fastest Way To Get On Track”, the program got underway in April and offers events at 20 different road courses across the country, revisiting most tracks on a monthly basis between now and the end of the summer when the program goes on hiatus. While there’s a strong focus on bringing track driving rookies into the mix, it’s also not exclusive to novices. 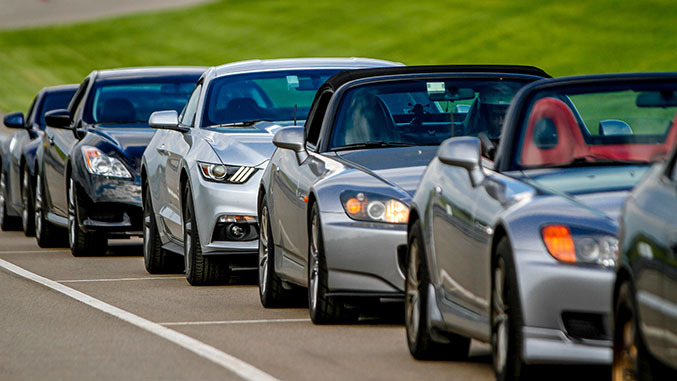 Like many privately operated track day events, Track Night in America programs are divided into three run groups – Novice, Intermediate and Advanced. Those run groups put drivers of similar experience levels on track together and allow event organizers to tailor instruction and on-track rules accordingly. SCCA instructors are on-hand at the events to provide information at the drivers meetings and field questions in between run group sessions, while other event staff man the flag stations, manage the logistics of the event, and so on. What Kind Of Gear Do I Need To Participate? In terms of safety gear, participants are only required to have a helmet with the most current or the two most recent applicable Snell, FIA, or SFI standards. You can find the full list of applicable Snell, FIA and SFI ratings here. In terms of racing gear, that’s it – closed-toed shoes are the only other universal safety necessity, though some tracks also require drivers to wear long sleeve shirts and long pants (which will be noted on the sign-up page if mandatory). Everything else is essentially optional – it would be wise to bring along, for instance, a basic tool set, some snacks and sunscreen, but in terms of safety gear requirements, if you have an eligible helmet you’re ready to go. The SCCA provides a list of suggested items to bring with you right here. What Kind Of Training And Licensing Do I Need To Participate? One of the biggest detractors for enthusiasts interested in getting on track is the confusion surrounding what memberships, permits, licensing and types of prerequisite experience are required to be eligible to participate in different types of events. 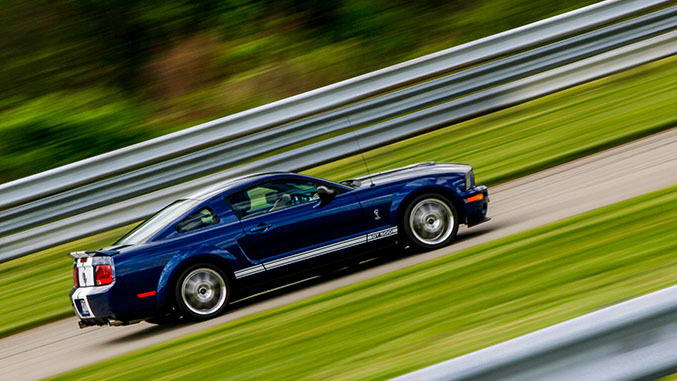 Track Night in America makes it as simple as is possibly could be – if you have a valid driver’s license and you’re 18 years old or older, you have all the licensing you need to participate in a Track Night in America event. You don’t even need an SCCA membership. 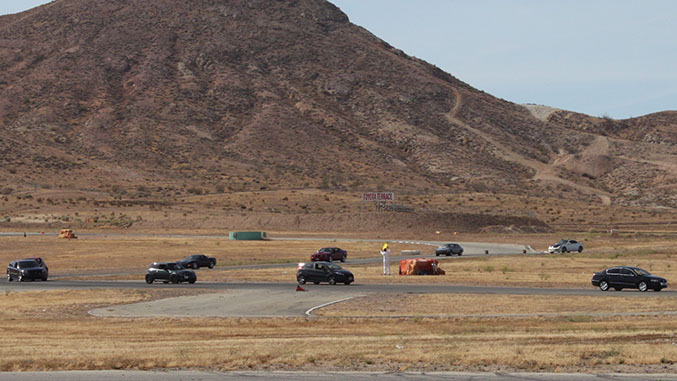 While it certainly doesn’t hurt to have a familiarity with the basics of performance driving, the Novice group is designed for participants with no prior track experience, and at the drivers’ briefing the rules that are laid out before sessions begin with a focus on the fundamentals to make it easy for rookies to get out on course safely. Intermediate and Advanced run groups are offered to drivers with some prior track experience and provide more freedom to pass (with a point-by) in different parts of the track, and these drivers can skip much of the pre-track minutiae by completing their tech sheets and drivers' meeting forms online ahead of the event. For participants who have no prior track experience, there’s essentially only two expenses (outside of obvious essentials like fuel, snacks, etc) – the cost of a helmet (varies widely depending on brand/model) and the $150 Track Night in America entry fee. That’s it. Pro tip: the SCCA occasionally posts coupon codes on their Facebook page that’ll knock another $50 or so off the entry fee, so keep an eye out for that when signing up. What Do I Need To Do To My Car To Prepare It For Track Night? Track Night in America is open to all road legal vehicles that are in good working order – that means all lights are functional, brakes and tires are in good working order, and the vehicle does not leak fluids or otherwise have any known mechanical maladies. An important distinction to note, both in terms of vehicle performance and driver mindset, is that these are not races. That means that while there’s no restriction on performance upgrades (provided the car is still set up as a road car), there’s no expectation of modification, either. We saw drivers in showroom stock VW Passats and Lexus sedans having a blast out on the track. 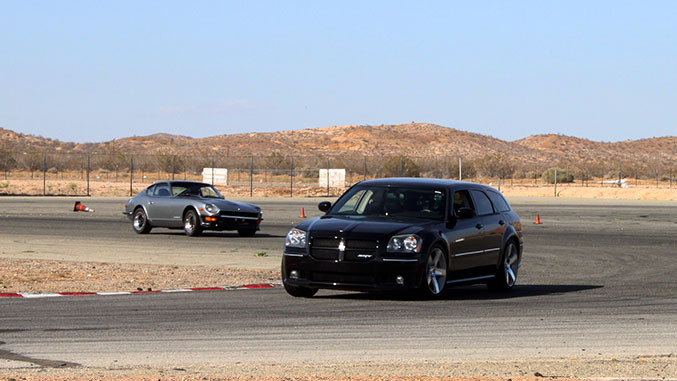 Before heading out to our Track Night in America event at the Streets of Willow course at Willow Springs Raceway we took stock of the mechanical condition of the car our pilot would be at the helm of – a 2007 Dodge Magnum SRT-8. After going through the checklist, making sure the brake pads had plenty of meat left and verifying the car was leak-free, we decided that it was time to swap out the tired set of Hankooks on the car for some new rubber before making our way out to the event. 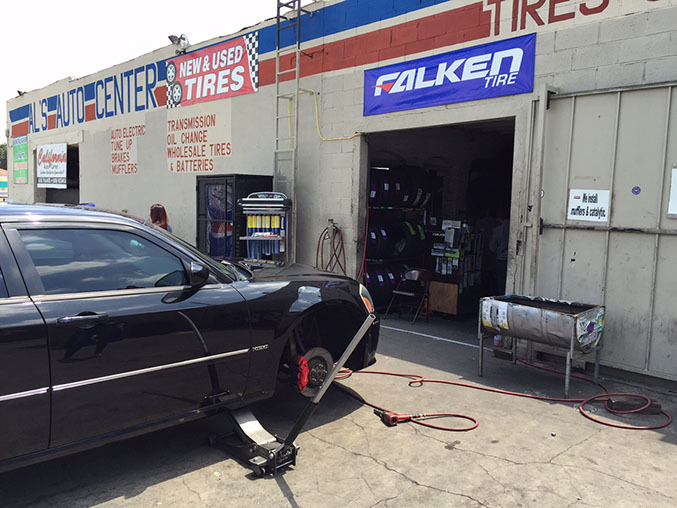 We went with a set of Falken Azenis FK453 ultra high-performance summer tires, as Southern California’s current year-round dry weather means we don’t have to worry too much about the need for all-season capability even during the winter months, and the tire’s Y speed rating (up to 186 miles per hour) has us covered well past the Magnum’s 169 mph top speed. More importantly, not only do high performance tires like the Azenis provide excellent lateral grip in the turns, that additional stickiness also equates to significantly shorter braking distances than typical OEM all-season tires. When you’re headed out on track for the first time, having confidence in your ability to stop the car is absolutely paramount. 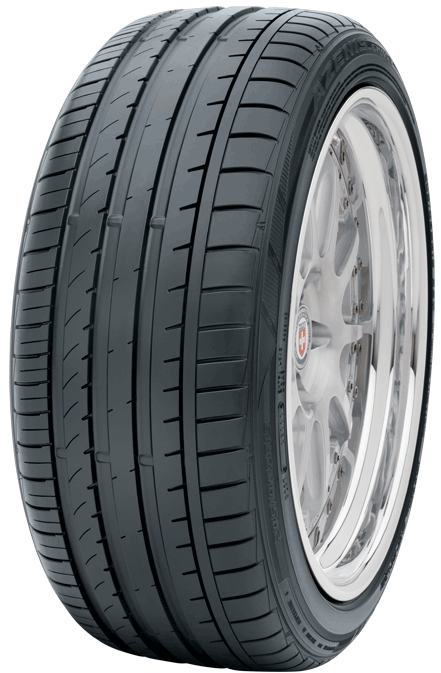 They also make the learning process easier on track – a good set of summer tires will allow a driver to progressively discover the limits of both the car’s abilities and their own, whereas less performance-oriented rubber tends to lose grip at a lower threshold and will often do so in a more dramatic fashion. Considering that they’re the only part of the vehicle that actually makes contact with the tarmac, if you’re unsure of where to invest some money to enhance your car’s capability on a road course, good tires are almost certainly the most effective upgrade to make and are generally a safe bet all around. What Is The Sequence Of Events At Track Night? Instead of kicking off early on a Saturday or Sunday, Track Night in America events are held on weekday afternoons and run until sundown. Gates open at 3pm, and the first mandatory driver’s meeting is held at 3:45. The novice group gets things underway at approximately 4pm, and the first session out on track has the participants following a pace car at low speed around the course for a few laps so that drivers can get acclimated to the course layout and learn the racing line. From there, run groups are sent out in rotation, with each group out on track for about 30 minutes per session. Meanwhile, the group that just came off track meets back up with the SCCA instructors for a de-brief session and to prepare to head back out on track. The format gives each group about 30 minutes in between run sessions. It goes by quickly, so not only is there no time for boredom, it’s also wise to make sure you arrive at the event ready to go and fueled up – if you have to leave the track to refuel or get food, you may miss one of your run group’s sessions. At 6pm, drivers from all run groups are allowed to participate in a fifteen minute session of paced “parade laps” in which anyone can ride along in a participant’s car, and helmets are not needed. This not only provides your friends and family an opportunity to get a first-hand view of what it’s like to be on a race course, it can also allow for more experienced drivers to ride shotgun on course with a new driver and provide feedback on racing lines, braking zones, etc. While you’re not traveling at regular session speed, getting coaching while on the course can be incredibly helpful. To that end, after clearing it with the event organizers and allowing our rookie to familiarize herself with the track and how to navigate it at high speed for a few sessions, we decided to ride along in the passenger seat for subsequent sessions to provide some real-time tutelage. We theorized that for a track newcomer, it made more sense to allow our driver to acclimate to the rules and dynamics of road course driving, as well as learn the layout of the track, before we hopped on board to provide coaching to generate faster lap times. In this case the theory paid off – after observing a few laps, we coached our driver through the course’s racing line, where to give it more throttle, where to get on the brakes at the end of the main straight, and so on. We noticed immediate improvement in terms of speed and stability, as well as a substantial boost in confidence behind the wheel. It was genuinely rewarding for both driver and coach, and we’d venture to say that if the resources are available, the SCCA might consider offering ride-along instruction for drivers who’d like to opt in at an additional fee. For drivers that have never ventured on track before, some of the basics, like interpreting the best lines to maintain around the course, are completely foreign and can’t be quickly understood without some hands-on guidance, and having some confirmation of both good and bad habits is also useful for newcomers without a frame of reference to compare their behaviors to. When the last session concluded just before 8pm, we knew that not only had our pilot made huge strides in terms of understanding the high speed driving dynamics of her car (both on and off track), she now had the confidence to tackle road courses on her own with an understanding of how to improve her technique over time. Each pass down the main straight we got on the brakes a little later and with more tenacity, each corner exit we were on the throttle a little earlier than the last time around, and each lap the enjoyment became more and more palpable. If you’ve never been on track before and have wondered how to get from Point A to Point B, or you have friends and/or family that want to get involved but have been hesitant because they either don’t know how or think it’s cost prohibitive, the bottom line is that Track Night in America makes it as simple and cost-effective as possible while providing participants with a safe environment to learn in. Those looking for a path into road course performance driving (which could very well lead to wheel to wheel racing somewhere down the line), your adventure could easily start here. Additionally, drivers who already have some track experience and are looking for an inexpensive way to get some time will also find that this is one of the most cost effective, well-organized and safest options out there.